This is definitely something you don’t see everyday. This is one of the most intricate “kit homes” I have ever seen, and perhaps that is also why it was only on the market for one year. 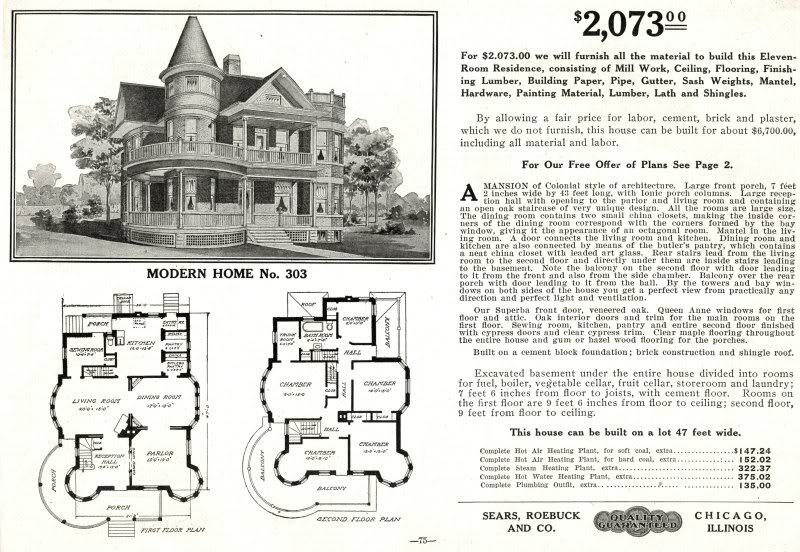 Sears Modern Home #303 is quite beautiful. A mansion of Colonial Style of architecture. Large front porch, 7 feet 2 inches wide by 43 feet long, with Ionic porch columns. 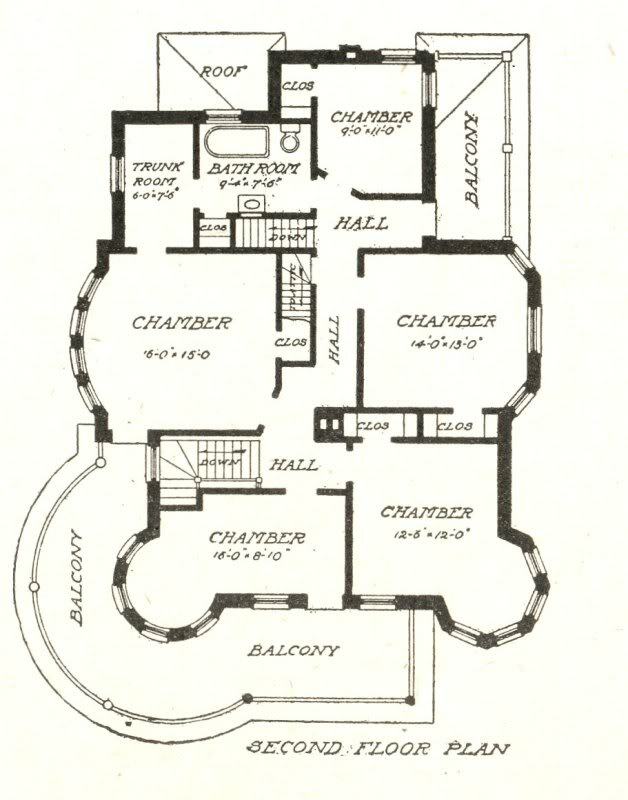 Large reception hall with opening to the parlor and living room and containing an open oak staircase of very unique design. All the rooms are large size. The dining room contains two small china closets, making the inside corners of the dining room correspond with the corners formed by the bay window, giving it the appearance of an octagonal room. Mantel in the living room. A door connects the living room and kitchen. 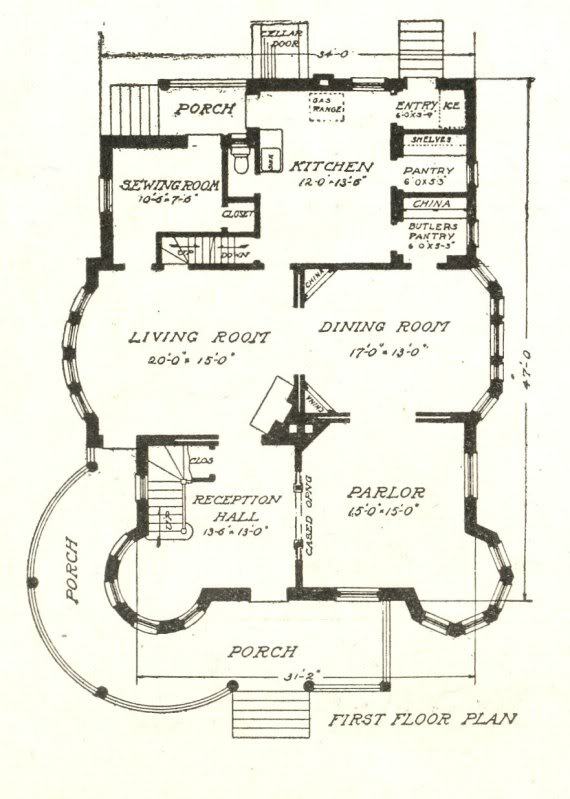 Dining room and kitchen are also connected by means of the butler’s pantry, which contains room to the second floor and directly under them are inside stairs leading to the basement. Note the balcony on the second floor with door leading to it from the front and also from the side chamber. Balcony over the rear porch with door leading to it from the hall. By the towers and bay windows on both sides of the house you get a perfect view from practically any direction and perfect light and ventilation. Our Superba front door, veneered oak. Queen Anne windows for the first floor and attic. Oak interior doors and trim for the main rooms on the first floor. Sewing room, kitchen, pantry and the entire second floor finished with cypress door s and clear cypress trim. Clear maple flooring throughout the entire house and gum or hazel wood flooring for the porches. Built on a cement block foundation; brick construction and shingle roof. With construction costs they estimated that it would have cost $6,700, and materials alone $2,073.